On Thursday 28th May, 2016 Strathmore University’s Community Service Centre through Macheo Achievement Program arranged for a 3 day male mentors and mentees camp in Kitui County. The group of 25 consisting of 13 mentors (Strathmore students) and 12 male mentees in Form Four at three Secondary schools in Kibera were accommodated at Kitui Pastoral Centre from Thursday evening to Monday morning. 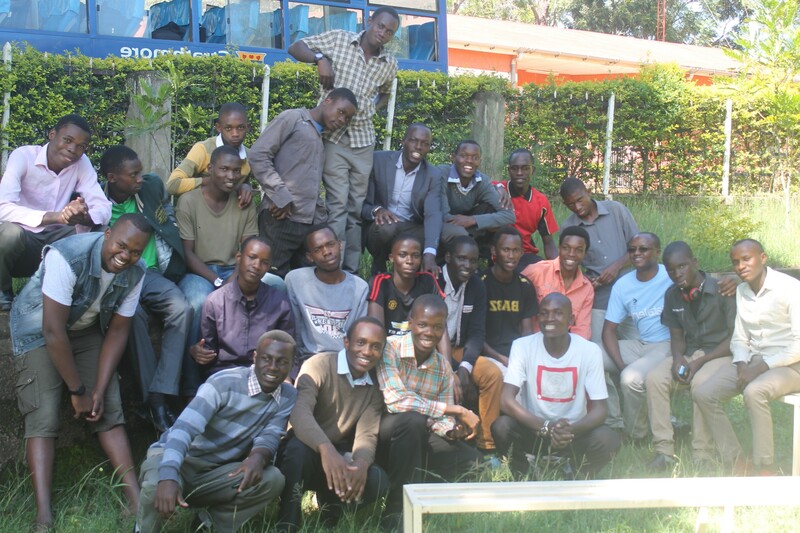 The group was accompanied by 2 SU Staff – Anthony Karuiru and Oliver Odoyo who is also a Macheo Mentor. The group engaged in a lot of fun activities and had mentoring sessions in which the mentors got to bond more with their mentees outside the usual environment they are used to in Strathmore. Activities included attending Mass, workshop sessions/discussions/presentations, talks, talent show and mentorship chats in the mornings, and sports and visits to Nyumbani Village, Kitui’s Nzambani Rock (a touristic site) and Mama Upendo Children’s Trust in the afternoons. Upon arrival on Thursday the group bonded as each and every person was allowed to share their life history and give an encouragement to one another. On the first day (Friday), the group visited Nyumbani Village. Impassioned about making a difference in the lives of children orphaned by HIV/AIDS and left in the hands of caregivers who are already vulnerable and helpless, in most cases, grandmothers, Nyumbani stands out from the usual idea of a children’s home.The Nyumbani community hosts 100 grandparents and 1000 children on 1000 acres at Kwa-Vonza. The manager of the village pointed out that the kids were so talented in every area including sports, academics and careers (for the ones who moved out after gaining independence). The mentors and mentees shared the goods which they carried for the orphaned children. On the 2nd day, the group visited Nzambani Rock – a mythical rock in Kitui which tops the list of tourist attractions in the area. The Nzambani rock – Ivya ya Nzambani – is unique, thanks to a story told by one generation to another… that if one goes round it seven times, they have their gender changed. The mentors and mentees were taken aback at the thought of this and only went round the rock once. It was an exciting time to learn the history of the rock and how much it is beheld in awe by the local residents of the area. On the 3rd and final day of the camp, the group visited Mama Upendo Children’s Home – a home that provides free shelter, care, education and future opportunities to children orphaned through HIV/AIDS or other misfortune. The mentors and mentees found this particular visit so fulfilling as the bonding they got to create with the children in such a short period of time made them cling to them till the point of their departure. The two visits to the children’s home was an eye opening experience to both the mentors and more to the mentees who appreciated the state of other disenfranchised kids who enjoy protection and mentorship from other groups of concerned people. The mentoring sessions were spread throughout the 3 days. The mentors and mentees were guided on lessons pertaining to reasons for study/hard work, meaning of life, importance of prayer, the need for mentorship and virtues by Anthony and Oliver. In addition both the mentors and mentees got to share experiences so far regarding mentorship in Macheo. The group discussed propositions on how to strengthen their mentorship relationship and make it a better experience than it has ever been. Their inspiration was also drawn from the noted improved KCSE Performance in the recent years from 2014 to 2015 of Macheo students. Both parties resolved to stay committed to achieving these resolutions and were so appreciative of the 4 day camp afforded to them by the COP’s Macheo Achievement Program. The group travelled back on Monday the 2nd May.